Timothy R. Porter was born on October 11, 1956 to Jack and Alma Porter of Fries, Virginia. He has one sister, Kathy Jackson of Fries, Virginia. He is married to Jane Kerrigan Porter of Bluefield Virginia, who is presently employed by Randolph County Schools as a Guidance Counselor at Providence Grove High School. Tim is a graduate of Fries High School, Hiwassee Jr. College with an Associate in Arts Degree, Tennessee Wesleyan College with a Bachelor in Arts Degree, Duke University with a Masters of Divinity Degree, and Drew University with a Doctor of Ministry Degree. All during High School and most of his college career Tim was a drummer in a rock/country band called "The Country Express". During summers he was employed during the day at a local textile mill doing various jobs and also as a camp counselor at the local Methodist Camp, Camp Dickenson. 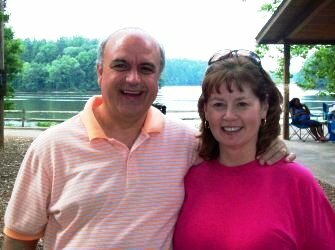 Before coming to Mitchell's Grove UMC, Tim has Pastored seven churches in East Tennessee and Western North Carolina. Most recently he comes from East Flat Rock UMC where he was the pastor for 17 years. Tim is a member of the Western North Carolina Conference of the United Methodist Church where he has served various churches in different locations since 1979. He is in his seventh year at Mitchell's Grove, where he continues to find an amazing hunger for the presence of God. "I can honestly say that Mitchell's Grove has become a fellowship of believers who are 'God Seekers'. The primary focus of this church is to help others experience the love and joy of Jesus. Once you get to know this community of faith you quickly discover that these are people who live in the real world and make real world mistakes, but who also have an intense dedication to the study of God's Word, and a love for God, a longing for more of the presence of God that brings them to a life in worship and prayer that ultimately expresses itself through love and service to our community and world." Tim loves sports. He lettered in baseball, basketball, and football at Fries High School High School, and played baseball in college until the Lord intervened and gave his life's direction a new focus. He also loves music, ever since he was 10 years old he has loved music and playing drums and both have been an important part of his life ever since. Tim loves to sing, and has been a member of a Gospel Quartet called the Soldier's Again for the last 20 years, they have two recordings produced by "The Loft Studios". Some of the latest Books read include; God Chaser's, Tommy Tenney; Secret Sources of Power, Tommy Tenney, Fresh Wind, Fresh Fire, Jim Cymbala, Fresh Power, Jim Cymbala, The Prayer of Jabez, Bruce Wilkinson, Secrets of the Vine, Bruce Wilkinson, Worship, The Pattern of Things in Heaven, Joseph Garlington, Outside The Camp, Terry Teykl. The Fourth Dimension, Discovering A New World Of Answered Prayer, Dr. David Yonggi Cho. Tim loves Contemporary Christian, Gospel, Easy Rock, Blue Grass, Jazz, and Country Music. "That I'm a genuine, honest, real believer in Jesus who is willing to be open to the everyday wonders of the mercy and majesty of God."